It was around 1 a.m. on a morning in 2011, and here was Amtrak’s highest-ranking HR officer, in his suit and tie, talking employee benefits in a baggage car. One of those workers was a train attendant whose wife was pregnant and due to deliver any day. He explained his current quandary to Melnkovic, who had joined Amtrak just months earlier. Having previously applied for paternity leave, the attendant made multiple follow-up phone calls to Amtrak’s benefits-service center, in an effort to find out if his Family and Medical Leave Act application had been processed and approved. Those calls went unanswered. And, with spotty cell service and a limited Wi-Fi connection aboard the train he had been riding for the last 24 hours or so, he couldn’t even call, text or email his wife to find out if she had the baby — or correspond with Amtrak HR to determine if he would be able to begin his leave upon returning home. The attendant — unaccustomed to seeing an Amtrak executive riding the rails alongside him — had no idea he was venting his frustration to pretty much the perfect person. Melnkovic’s first response was an apology. In this case, a simple lack of communication within the benefits team proved to be the culprit. And, luckily, this issue proved to have an easy fix. The attendant took his leave after returning from this trip, and that baggage-car conversation spurred Melnkovic to do his best to make sure other Amtrak employees didn’t find themselves in similar situations in the future. As part of what would become Amtrak’s first-ever Human Capital Strategic Plan — the establishment of which helped earn Melnkovic Human Resource Executive®’s 2016 HR Executive of the Year award — he pushed to have key processes such as FMLA applications ISO-9001 certified. Before Melnkovic’s arrival, Amtrak had never achieved ISO certification — meeting or exceeding a series of quality management systems standards designed to ensure an organization meets customer and stakeholder needs as well as product-related regulatory requirements. The organization’s FMLA process — which had previously been poorly documented, if at all — has since successfully completed two National Quality Assurance audits, and Amtrak has seen an 83 percent improvement in FMLA-request response time, says Melnkovic. What he did in response to that one attendant exemplifies Melnkovic’s success in taking on issues, making them his own and finding solutions that work. It’s the kind of success that has helped Amtrak achieve record ridership and revenue, land the company on Forbes’ America’s Best Employers list, and — something Melnkovic points to with great pride — receive recognition as one of Victory Media’s Top 100 Military-Friendly Employers. Currently, 26 percent of Amtrak’s roughly 21,000 employees have military experience. That number sat between 9 percent and 14 percent before Melnkovic arrived. He has spearheaded an effort that has sent Amtrak’s talent-acquisition team and hiring managers to more than 150 military hiring events in the past two years, and has partnered with 45 military transition assistance program offices and national organizations such as Hiring our Heroes, the U.S. Chamber of Commerce and the Wounded Warrior Project. Moreover, his efforts have helped rebuild an HR function that Amtrak President and CEO Joseph Boardman says “was largely broken” before Melnkovic got there — just one of the feats that have earned him HRE’s top award this year. At the time, he says, “no one was giving me great odds to get anything done” in an organization that had historically been stubborn to adapt. Boardman admits that Amtrak was paying the price for its obstinacy. The transformation didn’t happen overnight. When Melnkovic came on board, the HR function was “largely reactive in nature; not proactive and not tackling some of the very challenging issues the company was facing,” he says. For example, the organization had no real enterprise-wide workforce strategy, lacked an effective performance-management process and total-rewards system, and had seen retiree medical liability swell from less than $200 million in 2001 to $1.1 billion in 2011. Multiple independent inspector general-led audits had confirmed Amtrak’s lack of success in addressing such problems, having found nearly 60 major deficiencies in structure, programs, processes and technology within HR at Amtrak. Melnkovic clearly had a lot of work ahead. But the native of Windber, Pa. — a small, industrial town located about 90 miles east of Pittsburgh — and son of a homemaker and a steel-mill welder wasn’t afraid of getting his hands dirty. In fact, the degree of difficulty was an aspect of the job that drew him there. Melnkovic’s vision was to implement the aforementioned Human Capital Strategic Plan. His first order of business was to share his vision with those who would help him realize it. And, naturally, he would do it in person. He traveled to host a series of face-to-face meetings — which he still does — with Amtrak board members, managers and employees throughout the organization, to lay out his three-year roadmap for making more fiscally responsible use of the organization’s resources, teaming HR with the business in strategy development and execution, creating a more results-oriented culture and overhauling Amtrak’s rewards structure, or “making the right investments in the right rewards,” he says. Board members, in particular, took some convincing to get behind Melnkovic’s plans to introduce fundamental changes to Amtrak’s total rewards, benefits and overall talent-management strategies, says Nancy Naples, former vice chair of the Amtrak board of directors and the one-time chair of its human capital and compensation committee. With unanimous board approval to establish Amtrak’s human capital strategy, Melnkovic first had to reshape the team that would help carry it out. For example, “I had to make some hard decisions on the human capital team I inherited,” says Melnkovic. His reconfigured HR team established the Human Capital Business Partner role in 2012, created to define performance specifications and develop succession plans, for example. 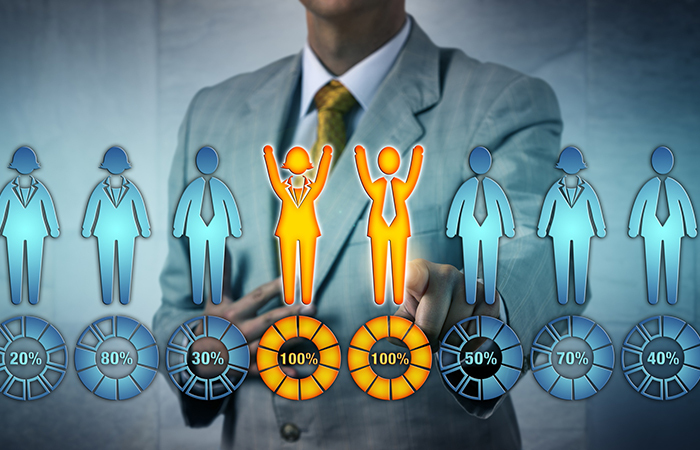 Melnkovic outlined the part that business partners would play in ensuring performance and compensation differentiation without forced ranking, for instance, as well as working closely with HR’s human capital workforce planning and analytics subgroup to maintain the organization’s talent pipeline. In addition to applying these principles to streamline and better document the FMLA process, the team has also helped reduce the time to fill vacancies for unionized positions by 45 percent. And, while Amtrak had not pursued ISO certification prior to Melnkovic’s tenure, the organization’s HR function is now the only department within the company to receive certification, with 14 human capital processes now ISO 9001-certified. Some of the same leaders from the lean team would join Melnkovic on the Amtrak Learning Council that he spearheaded as part of the implementation of his strategic plan. Along with Melnkovic, the group includes Amtrak’s chief operations officer, chief marketing officer and senior vice president of finance, and meets monthly to share information, make decisions and coordinate training efforts across the organization. With input from the Learning Council, Amtrak now conducts an annual needs assessment to identify technical and non-technical training needs, and implement new offerings based on the results of these evaluations. To sharpen Amtrak’s focus on customer service, for example, Melnkovic and his council colleagues helped design components of the Amtrak Customer Experience training program, run by the operations team and designed to redefine, elevate and transform the company’s customer-service culture. The ACE program starts with two days of interactive learning, during which participants learn the concepts of customer service, based on the wants, needs and expectations of Amtrak customers that are identified through focus groups and surveys, which the HR team helps select and administer. Managers undergo a third day of ACE training focused on their specific leadership responsibilities. Indeed, Amtrak has seen customer satisfaction steadily improve since the program’s inception, achieving a four-point increase (from 77 to 81 on a scale of 100) from fiscal year 2015 to fiscal year 2016. Employee satisfaction is central to the Human Capital Strategic Plan’s success as well. Melnkovic’s implementation of a substantial cost restructure, in the form of significant changes to Amtrak’s total-rewards program, has been a key to increasing employee engagement. “When I arrived at Amtrak, there was no variable incentive pay,” says Melnkovic. Instead, the organization historically awarded annual merit increases that were unrelated to organizational or individual performance. With the implementation of Amtrak Total Rewards, Melnkovic and the human capital team introduced a short-term incentive for all nonunion employees to be awarded each year based on performance outcomes, as well as a three-year incentive for leaders and the Amtrak Achievement award to recognize individual and project-team achievements each year. Melnkovic has also initiated benefit changes that figure to achieve significant savings for the organization. For example, Amtrak estimates it will save $1.4 billion over 20 years by closing the pension and retiree-health plan to new nonunion hires. In addition, Amtrak expects to see a $655 million balance-sheet improvement over five years by freezing pension accruals and moving post-65 retirees to a private healthcare exchange. It also anticipates saving $23 million over the next five years through a yet-to-be-introduced consumer-directed health plan. Recognizing that tweaks to benefit plans are not always popular with employees, Melnkovic pre-empted the change by hitting the road to meet with those who would be most affected. These visits didn’t always go smoothly. “No question was off-limits, and sometimes things got chippy,” says Melnkovic. He recalls an Amtrak employee in New Haven, Conn., who “was kind of snarling” at the start of the meeting. This particular worker, says Melnkovic, was upset about the prospect of absorbing additional healthcare costs. To further allay such concerns, Melnkovic followed up these meetings by hosting webinars explaining benefits changes, mailing notes home to employees, sending out corporate communications and setting up dedicated toll-free numbers for relevant questions and vendor concierge meetings. Indeed, throughout his career, Melnkovic has relied on and been driven by this hands-on, up-close and in-the-trenches leadership style. Over the past decade, Mark Andrekovich and his team at Maximus have been instrumental in reigniting their company with a whole new approach to HR. For Jennifer Martin, taking over HR at Alliant meant turning a structure-less function into one that now serves many vital, cost-saving systems. As Carhartt Inc.’s first-ever HR hire, Jennifer Piscopink continues to provide a much-needed sense of company culture to its growing workforce. To lead in the new “imagination economy,” HR leaders have new ways to perceive—and steer—our organizations for agility and reinvention.